Dream Pod 9: Lynx Two Pack Now Available! Phil took the time to paint up the Lynx in both walker and ground (bike) modes with and without the armored upgrade. 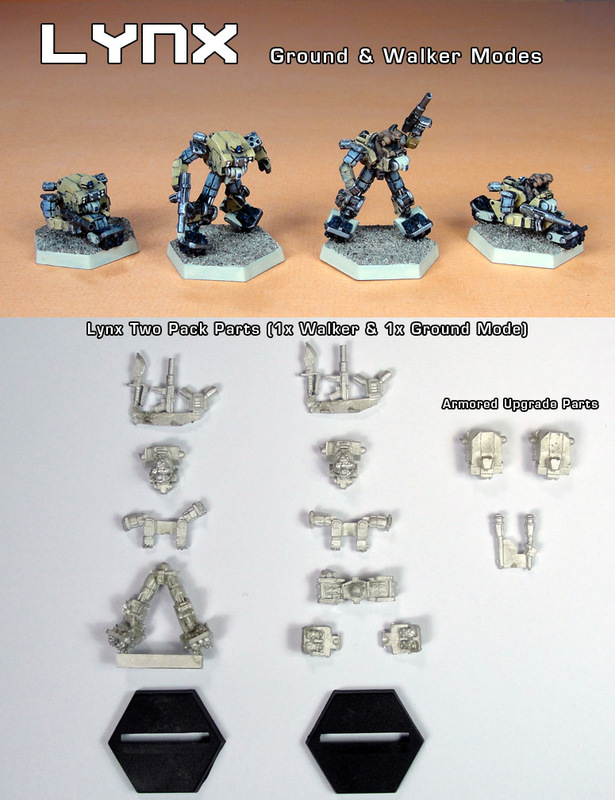 A photo of the painted up Lynx miniatures along with the pewter parts photo is shown below. The Lynx is used in North Infantry units and is about the same size as Cheetah Gear for reference. It can also be fielded as a support unit in some Sub-Faction Forces for the South, Peace River, and NuCoal that have the North Allies option. Plus it can also be included in a Leagueless Force. Here is a link to the ordering page for all interested. Home › Blogs › Robert Dubois's blog › Lynx Two Pack Now Available!